Matthew Howearth cashes in three Sydney Championships events including a win in the $1,650 Omaha event. 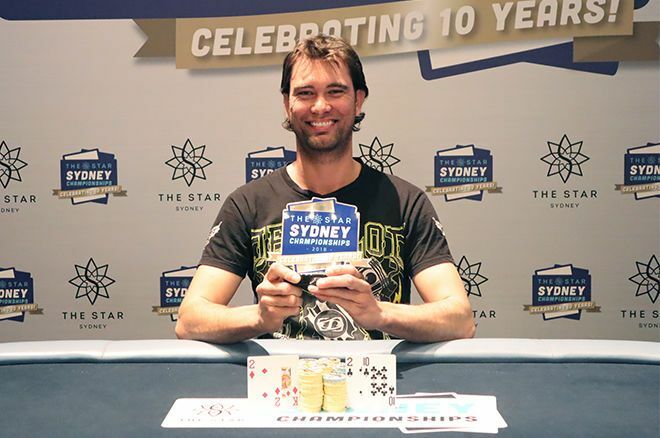 Matthew Howearth outlasted a field of 84 players to win the 2018 Star Sydney Championships Event #7: A$1,650 Pot Limit Omaha event for A$41,283 ($30,571). Virtually unknown in poker circles before 2018, Howearth came to prominence at the 2018 Aussie Millions where he finished fourth place in the Turbo Shot Clock Event for A$19,850 ($15,825) for his biggest cash leading up to the event. "This is my biggest ever win which is a great feeling for me." The victory capped off a very successful Sydney Championships for Howearth with three cashes in the festival. After ending Day 1 of the Monster Stack, he finished in 29th place for A$ 2,194 ($1,626) before also taking 27th place in the next tournament, the 6-Max for A$ 1,652 ($1,223). According to the Star Poker Room Blog, Howearth fell short in his first two cashes despite getting a great start. That was not the case in the Omaha event though he eventually went all the way to take the title, in a very important moment to him personally. "This event meant a lot to me," Howearth said to the Star Poker Live Reporting Team. "I have had a good series so far getting deep in a few tournaments. This is my biggest ever win which is a great feeling for me." The win was made even more special by the quality of opponents in the event. This wasn't a big field event where players could just find their way to the final table, this was a tough slog where every player was extremely talented. "I knew I couldn't make a mistake. I just focussed on finding my groove and ensuring that I did the best I could at all times." The final table was particularly tough with WSOP Bracelet Winner Gary Benson boasting more than $2 million in tournament earnings, Lee-Ann Christine Hia, who has won three major tournaments here in the last 2 years including the Ladies Event at this series and the 2016 WSOP Omaha Event, and Corey Kempson, who is an extremely revered online player with excellent technical ability. "It was definitely a tough field," Howearth recalled. "I knew I couldn't make a mistake. I just focussed on finding my groove and ensuring that I did the best I could at all times." Howearth found his groove, especially when he was heads-up for the title against Mark Fester. It became very clear that this tournament was only heading one way. Sponsored content by the Star Poker Room.